If you’re thinking about keeping honeybees in Edmonton you’ve probably come across the City of Edmonton’s Urban Beekeeping page. If so, you’ve read about four steps, city guidelines, swarm plans, PID numbers, and provincial agriculturalists. And if you’re like me, you’re probably a little confused, overwhelmed, and still unclear about what to do. Not to worry. For clarity, I’ve deconstructed and reassembled the Edmonton Beekeeping application process into a dozen baby-steps. By completing the following checklist, you’ll have everything you need to start beekeeping in Edmonton. Honeybees are living, breathing creatures and require a level of commitment that’s worth considering. As a beekeeper, expect to inspect your bees every 7 to 10 days. Why 7 to 10? Because honeybees can build up, run out of space, start making a new queen and swarm in a little over ten days. In addition to monitoring for diseases, you’ll need to give them more room as needed. It’s also worth considering a second hive. Setting up two colonies may be more expensive, but it will also give you the most options. A second hive gives you the ability to transfer honey, pollen, or brood from a stronger to a weaker hive. If one hive goes queenless and doesn’t have any eggs to make a new queen, you can supplement it from your healthy hive. Two colonies in not twice as must work but it is a beekeeping best practice. The best place to put a hive is where it’s convenient and safe to do so which generally means avoiding high traffic areas and keeping your bees where you can see and access them. I inspect all of my hives every 7 to 10 days, but I’ll be the first to tell you that the two hives in my backyard get the most attention. I see them every day and have a pretty good idea what’s going on inside even without opening them. You’ll want to face the entrance of the hive away from any foot traffic. I like to leave a good 10 feet of room in front of the hive so that the bees can come and go relatively easy. I also want to leave some room behind and beside the colony because that’s where you’ll do most of your management. Honeybees are diurnal (the opposite of nocturnal) and thus benefit from some sun exposure. In addition to using the sun as a reference point when communicating directions, direct sun exposure will warm the hive each morning and signal that it’s time to start foraging. Southern exposure is great if you can offer it. Hives must be located 3m away from property lines or separated by a 1.5m (~5 foot) tall solid fence. It’s worth noting that if you’re placing a hive on someone else’s property within the City of Edmonton, you’ll need to get a permission letter to attach to your Edmonton Beekeeping application. 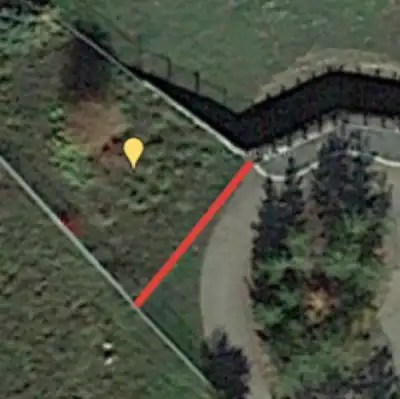 Screenshot of the location of honeybee hives at the Edmonton Zoo. Using Google Maps. Now that you’ve determined a suitable location make a simple sketch. Why? Because the City of Edmonton is going to want it as part of your Edmonton beekeeping application. Don’t worry if you’re not an artist. I’ve given them a picture of two rectangles – one my yard and one the beehive within it. The City primarily wants to know that you’re following the four requirements set out in their guidelines. You’ll be asked to attach a copy of this sketch while completing your application which is why I like to use Google Maps, though, taking a picture of a drawing should also work. Books are a great source of information – two that I’d recommend are Micheal’s Bush’s “The Practical Beekeeper” and Noah Rich-Wilson’s “The Bee: A Natural History.” That being said, there’s nothing like taking a beekeeping class and being able to interact with an actual beekeeper – even better if the class has a hands-on component. The City of Edmonton requires that all new beekeepers take an approved beekeeping course. A complete list of Approved Edmonton Urban Beekeeping Courses is found on their website. Shamelessly, I’ll mention the beekeeping course I teach twice each spring and fall at the City’s John Janzen Nature Centre? The course consists of a full day of theory followed by a half day of hands-on experience inspecting my hives. Read more about the John Janzen Beekeeping Course here. As part of your Edmonton Beekeeping application, you’ll have to include a swarm and disease prevention plan which will be easier to do after having completed a beekeeping course but will undoubtedly include regular inspections to ensure that the bees don’t run out of space. With routine maintenance, you’ll be able to prevent or catch diseases before they become major concerns. With the advent of the internet, you can order equipment from all over the world, though, there’s a pretty good supply of local beekeeping equipment. The largest local supplier of equipment (hives, smokers, veils, etc.) is Beemaid in Spruce Grove. What Is The Beecentric Hive? Generally speaking, there are two ways to acquire honeybees – packages and nucleus colonies (nucs). Both cost around $200 (plus/minus $30) depending on the year. Packages – approximately a kilogramme of bees and a mated queen. Order in the new year for mid-April to mid-May pick up. Alberta Beemaid is the largest supplier of packages in Alberta. Nucs – typically five deep frames with bees, eggs, open and closed brood, and a laying queen. Order in the spring for late May or early June pick up. One local source that I like is Koha Apiaries. Make a copy of your notification letter so that you can attach it to your Edmonton Beekeeping application. In the Province of Alberta, all livestock (including bees) must have a registered Premises ID number. This PID number is part of a traceability program keeps track of all the livestock in Alberta. Among other things, this information is crucial in the prevention and spread of diseases. Click here for more on Alberta’s PID Program. To create an Alberta PID number, sign in or create a free login on the PID program website. Once logged in, click “Add New Premises” and follow the directions. Create a PID number for each location or bee yard. You do not need a PID number for each hive. A copy of your PID number will be mailed to you and appear online. This process only needs to be completed once (per bee yard). Keep a copy of your PID number handy as you’ll need to submit it to the City as part of your application. You’ll also need it to purchase medications from suppliers like Beemaid. The Province of Alberta requires every beekeeper to register with the provincial apiculturalist every year before June 30th. The process is easy, free, and quick. Just complete the Beekeeper Registration form and mail, email, or fax a copy to the province. This process provides the province with relevant information such as the number of hives and winter survival rates. Once you’ve completed the steps above, you’ll have everything you need to apply for an Edmonton Beekeeping license via the City’s Web Application. Once you submit your application, you’ll receive a notification email. Within a few weeks, you should receive your beekeeping license in the mail.